Oh how I wish I had a dishwasher! We were going to get one this month, when we redid the kitchen, but the van got it's transmission rebuilt instead. So my kitchen is still a wreck. I seriously hate being in there. The only wall that is even painted is the new wall Dan built in there. I think since I'm being forced to wait on new cabinets and stuff, that the kitchen must be a t least painted. And soon! It's so depressing! We've gone back and forth on this; Dan wanting to not bother until we can afford a complete kitchen redo, but then he's hardly ever in there. He tore the existing ceiling covering out, which makes me nuts! I really want to look at something other than the icky, dusty, 100 year old boards that barely separates the kitchen from the attic. Plus, there is a hole in the ceiling from when he fell through from the attic. It soooooooo bothers me! I am going to paint this kitchen, even if I have to do all the painting myself! The big problem for months has been choosing a color. Some days I like red, others blue, sometimes yellow, I could go on and on. So, what do your kitchens look like? Any great advice for me? I want to keep a country cottage feel to it. I would not know where to put a dishwasher nor would i use it. 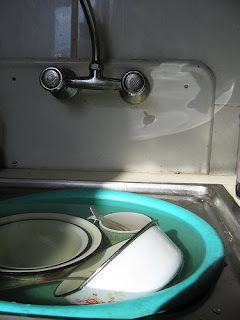 Heck even at the B&B i washed the dishes by hand and used the dishwasher as a draining rack. Think of the energy your saving? Hey I am trying to see the positive for ya! I have never had a dishwasher up until we moved here in Sept. I LOVE IT!! Especially after cooking for a crew...MAN it saves me a lot of time! hello swap partner! i wish i had a dishwasher too. perhaps when i move in may/june! i hope you get one sooner though... i'd send you one, but i am not sure it would fit in the box :) nice to meet you too! We redid our kitchen in 1998. Went right down to the studs and we (hubby and I) did all the work. The only thing we didn't replace was the fridge. Waaay to expensive. By now the floor needs to be refinished lol. Color?? We don't really have any walls in the kitchen. We put in a green lamanant counter, the space between the counter and the top cupboards is a white tile. We are in the middle of a project now of painting the living room, dining room and hall. Like all things it has snowballed. Keep working on that kitchen, the longer it takes the more you'll appreciate it.